So you are starting out with poker and not sure why you aren’t winning yet? I was in the same situation- you know what the problem was? I was making some pretty common mistakes that, in fact, are pretty easy to fix. So in this post I have listed the 20 most common poker mistakes that should only take a few minutes each to fix. Check them out below to improve your game, get you off to a winning start at the tables! When calling with a draw (for example, a flush draw with A♥K♥ on a 9♥5♠2♥) you must have the correct pot odds and equity to call. The pot odds depends on your opponents bet size, and the size of the pot whereas your equity depends on how many outs your draw has. For the A♥K♥ example above, the you have 9 hearts (Q♥ J♥ T♥ 8♥ 7♥ 6♥ 5♥ 4♥ 3♥) to make a flush draw which in all cases but the 5♥ (due to the full house possibility) will give you a flush draw and best hand possible (called the nuts). You can also win with any Ace (A♦, A♠, A♣) or King (K♦, K♠, K♣) which gives a total of 8 hands to the nuts and a further 5 to what is likely the best hand – this whole process is called counting outs. So this is an easy call or raise against most bet sizes due to the number of outs we have and the strength of each of these outs. What if you had 8♦7♦ on a J♥T♠5♣ board? Would you also call vs almost any bet size? Well this situation is very different because this time we only have 4 outs (9♥, 9♦, 9♠, 9♣). And to make matters worse, these hands are not to the nuts: if somebody has K♠Q♦, any 9 would make them a better straight and we would end up losing a big pot! Takeaway: Make sure you understand pot odds, equity and counting outs so you can stop making bad calls on the table with your draws! That means that if you just go out and play the game of poker, you should get better. That’s true to a certain extent, but to really improve your game you have to work intently on very specific parts of your game (opening ranges, squeezing, playing the flop, turn or river, playing in 3bet pots etc). My first recommendation: read this post by Splitsuit on learning poker from scratch. This contains a blueprint for how to learn poker in 2018 from knowing very little. My second recommendation: Check out our recent post on the best poker training sites and find a training site which will help you take your game to a new level. You will be able to become a great poker player without paying for training, but it will take much longer. So figure out if investing in your game is worth it for you. My favorite training for someone learning poker from scratch is upswing’s poker lab as it teaches you to be a great MTT, cash and live poker player. Find out more here about the upswing poker lab in my full review here. Sitting down at games within your limits is key to becoming successful at poker. If you only had $1000 and were to sit down at a poker table with all that money, how likely is it that you will go broke and lose it all? It’s pretty high percentage, probably above 50-60% that you will lose it in that session. But if you were to sit down with all your money every time you sat at a table, the likelihood of going broke is 100%. There is no player, not even Phil Ivey, who can sit down at a table with his entire bankroll and expect to come out alive at a reasonable frequency. So do yourself a favor and read up on correct bankroll management strategy. If you are playing tournaments, you should have at least 80-100 buy ins for the stake you are playing but the higher the better. So if you are playing $1 tournaments you need preferably $100. If you are playing cash games, you need 20 times your buy in as a bankroll. So if you play $100 buy ins, you should have $2000 set aside for playing poker to ensure you are less likely to go broke. This would be for somebody who cannot afford to go broke and replenish their bankroll. If you are a casual player, who can put some cash into poker every month, you can loosen up these requirements. Takeaway: Learn how to manage your poker bankroll and ensure that you don’t go broke! Poker can be a stressful game which can cause you to tilt even if you are one of the most composed of players. Tilt induces poor play by not allowing players to think clearly. Keep a level head and your emotions under check. I see this all the time at the poker table and it is a dead giveaway they are a new poker player! Let say that you have A♥K♥ again on A♦K♠7♦ and the pot is $10. You bet $6 on the flop which is reasonable, then turn comes a 5♣ after your opponent calls. Again you bet $6 but this time into a $22 pot (10+6+6) and after your opponent calls, the river is a T♦ and you AGAIN bet $6 into a $34 pot this time. Do you see anything wrong with this strategy? By keeping your bet size constant, the size of your bet is reducing after each street. On the flop it was 60% (6/10), on the turn it was 27% (6/22) and on the river it was a messily 17% (6/34) of the pot. Why doesn’t this betting strategy work? Well on each street your bet decreases relative to the total pot which means that your opponent can call profitbaly with a lot of hands. That means that bluffing will not work (as your opponent won’t fold) and when you have a strong hand, value betting won’t win you much. As a new player, basic strategy that will work much better is keeping the size of your bet relative to the pot constant . This is a common poker leak with usually made by beginner poker players: players won’t fold with their marginal hands hoping that villain is bluffing. Most low stakes poker players do not bluff often enough for you to be able to bluff catch with marginal hands. If you are facing a lot of aggression, it usually a sign that you are beaten and that you can happily fold. This is especially true at the low stakes where opponents are typically much less aggressive than they should be in theory. Let’s take an example, you bet the river after also betting the flop and turn with your top two pair A♥K♥ on the board A♦K♠7♦ 5♣ T♦. Your opponent suddenly comes to life and raises your river bet. You have top two pair and your opponent could be bluffing, right? NO: this is a clear fold. Your opponent has likely made a flush with a hand like 9♦8♦ or at least a straight with Q♠J♦ and decided to raise you on the river. New players to the game think, I have two pair and cannot fold! Well if you want to become a profitable player, sometimes you have to lay down big hands! Takeaway: Learn to fold to aggression and your back pocket will thank you! Poker is a war of information. The more information you have on your opponent the more likely you will be to win. Start paying attention to your opponents tendencies and make note of something you can use to beat him in the future. It might be his demeanor when bluffing, or how he acts confident when holding a strong hand. Even if you don’t take a notepad to live games, make sure you take a ‘mental note’ of anything useful. I had such detailed notes on some of the regulars at the zoom tables I play, that I would often be able to read the player like a book. I write in a short hand style that I can understand to make it much quicker to write notes. These notes are quite detailed and give me a good idea of how my opponent plays -this allows me to exploit him much easier. I might also include details such as “is likely to call down river bets light” which will make me think again if I was to try and bluff him. Taking notes is quite easy and has some great returns so make sure you check out this great guide to get started. It is often thought that you have to outsmart or trick your opponent when playing a game of poker. New players often replicate this by playing the opposite of the way they should i.e. betting all their weak hands and checking and calling their strong hands. Essentially, poker is a game of making good decision after good decision. Don’t over complicate the basics by getting too fancy! When an inexperienced player gets a strong hand (such as AA or KK preflop) they are tempted to slow play their hand to not fold out everyone from the pot. This is the wrong attitude; it often leads to winning a small pot or losing a big one when your aces get cracked. Hence, raise and reraise your strong hands, a big hand deserves a big pot! Small aces such as A6 and A2 are known as Ace rag. Often, inexperienced players see an ace in the hole and think the hand is much stronger than it actually is. Weak aces are dominated quite often by other opponents stronger aces which means you will either lose a big pot or win a small one. There is a time and place to play weak aces. Make sure you know when by reading up on position is king. One big mistake made by new and experienced players alike is moving up in stakes to recoup losses. This is a huge mistake and can often lead to you losing your whole bankroll. It always helps to ask during a big losing session: “Am I playing my best poker right now?”. The answer is most likely no. So book a losing session and call it a day! Even worse, if you find yourself tempted to move up in stakes to chase losses, quit your game immediately and go find something else to do. You will be grateful the next morning, I promise! When calling a bet or calling a raise you should have a plan for what you are going to do on the following streets. Are you going to call or raise? On which cards are you going to fold if your opponent bets? Having these decisions already worked out before the situation occurs stops you from making emotion based decisions. As a result, your decisions are based more on logic and the fundamentals of poker! Similarly, when betting you should also know what to do when your opponent calls or raises. The more you can think about future streets, the more easily you will be able to exploit your opponent and the more profit you will make on the felt. To start with this, simply try to think about what you will do preflop if your opponent raises you. What will you do if he re-raises small, medium, or a big size? As you can imagine, there is a lot of depth you can go into with this… but the best players are the players who are already 3 steps ahead of their opponents. So try it out and let me know if it helps! Poker is a difficult game, and as a result, we tire quickly when playing (particularly if you are a new player). Make sure you take a break every hour for a few minutes to freshen up. Even going for a 5-minute conversation about non-poker related stuff will allow you to refocus. I remember when I used to run deep in a tournament when playing online, it would go onto 5 or 6am and I could hardly keep my eyes open. So what did I do? Pushups during the 5 minute stoppages on the hour. Yes, pushups at 6am… maybe not something you can do when playing a live tourney, but anything to get an edge when you can. Your mental game is almost as important as your technical game; however, the majority of inexperienced players completely neglect developing it. Controlling your emotions, recognising when you are tilting and playing in the zone are all part of your mental game. There is a lot to the mental side of the game (and hence why there are coaches dedicated to this aspect such as Jared Tendler) but one of the simple tricks I can tell you is try to become aware of your thoughts and emotions. One of the best ways to do this is to mediate. You probably heard that one before, but that’s because it works! To find some more details see my blog post on mental game. We all have lives outside poker and unfortunately, it can affect our poker game in some cases. Have a fight with your spouse? Your boss on your back? Now is not the time to play poker as you are vastly more likely to have a losing session; hence playing poker will only make matters worse. Take a break, relax and come back another day. There is always another day to hit the felt. A common poker mistake you can easily avoid! Poker rooms offer bonuses for new players which can be a real bankroll builder. Make sure you seek out all the top bonus offers and take full advantage of them. Sometimes, they can even double your bankroll if you find the right offer. Bonuses do require a certain amount of play to be released, however! Check out our best online poker sites page for more information. Boredom can be a real issue for some players; this is especially true when playing live as so few hands are played when compared to online. But the simple fact is that if you are bored you aren’t paying enough attention to the action around you. You should definitely check out these preflop hand charts that Upswing are giving away from for free that have been downloaded almost 200,000 times. Find out roughly what hands you should be playing on a full ring table to take the guessing out of your poker game. Try follow the action even when you aren’t in the hand to discover opponent’s tendencies or work out what hands they are holding. Playing poor holdings to suppress your boredom will only cost you money in the long run – so make sure you aren’t tempted. Cold calling is the act of calling a raise when you have yet to invest in the pot. When a player raises and then another player reraises (3bets) they are both likely to only continue with very strong hands (88+, AJ+) so cold calling with a hand such as QJo is extremely unprofitable. When facing a raise and a reraise you should be only continuing with premium holdings such as JJ+ and AK. EP is a difficult position to play from as there is so many players left to act; any of whom could have strong hand. This means that you should be playing a very narrow and strong range of hands from this position. Hand such as weak pairs, weak aces and offsuit broadway hands shouldn’t be played from this position. Again, check the preflop hand charts from upswing for a better idea of what hands you should be playing. For more info on how position effect the hands we play, see Position is King. Table image is the how you are perceived by your opponents. If for example you are seen as aggressive your opponents will be more likely to call you down light because they think you are bluffing frequently. Conversely, if you very rarely raise your opponents will know to fold when you do start raising. Inexperienced players do not take into account previous history and table image very well. Make sure you understand how your opponents have been playing and use it to your advantage. Don’t talk to someone while they are in hand. When a player is in a hand they need to concentrate and they will not appreciate you trying to maintain a conversation with them. Pick up the conversation after the hand has ended. Don’t allow anyone to see your cards until the showdown. Only one person to a hand while the hand is in play. This ensures that you are not unfairly receiving advice and negates the chance of your cards being exposed. Avoid making string bets – string bets are when you say I call your raise and raise you more. The first action out of your mouth is (call, raise or fold) is the action you will be forced to take in a casino. Pay attention so that you don’t delay the game. The situation comes up in the casino quite often – players will no realize it is their turn to act and they slow up the game. Always keep your eye on the action and be ready to act when it is your turn. Act in turn. The game of poker is structured so that everyone will act in specific order. Not following this order will put someone unfairly at a disadvantage (usually you). Do not ask to see mucked hands. A player may throw his hand away after being called and the river as he knows he is almost always beaten. Don’t ask to see his hand, this would be very poor etiquette. 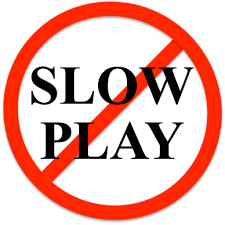 Slowrolling – slow rolling is the act of pretending you have a weaker hand than you do in order to trick your opponent into thinking he won after the hand has ended. This is frowned upon at the poker table. The only acting or tricks you should pull should be when the hand is in play. Not afterward. Blaming the dealer – the dealer isn’t at fault for you being dealt poor hands. He is just shuffling the deck and doesn’t have a personal agenda vs you. So make sure you treat him with respect. Need more than this common poker mistakes? Well take your game to a new level with professional poker training where you can quickly improve your poker game by directly learning from professional players: find out more in our poker training sites page.